Birleşik Metal İş | Proletarians of all countries, Unite! We don’t Recognize the Strike Ban! We are on strike on 2nd of February! 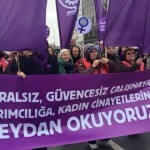 During the ongoing group collective bargaining process with Turkey Metal Industrialists’ Union (MESS) covering 130 thousand workers, at a stage when the strike was declared in the workplaces, the Ministerial Cabinet banned our strike decision. In the collective bargaining negotiations of the 2017-2019 period, which continued between our union and MESS and resulted in a dispute, the strike in this process was banned before it even took place. In particular, with the strike ban announced today before the meeting with MESS, the government once again showed its open support to the MESS and bosses and ignored the struggle of 130,000 metal workers. We ignore and do not recognize this unthinkable assault on our Constitutional right to strike. It is not acceptable that the Council of Ministers prohibits the strike of 130 thousand workers on the grounds that it is “harmful to national security” especially on the day when MESS invited 3 unions to meet again at different times on the same day. Metal workers will give the necessary response to this Government who is enemy of the workers. 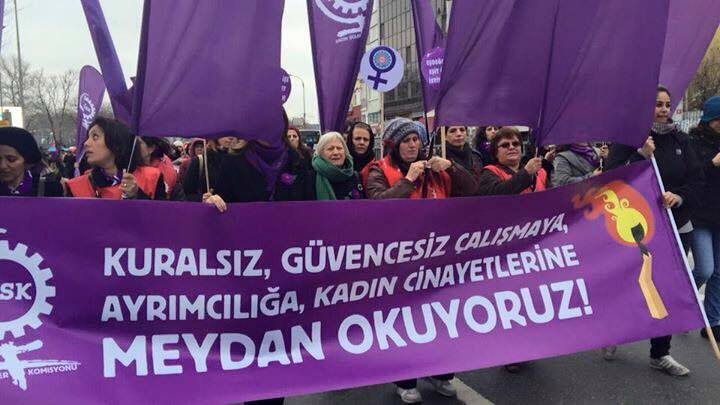 By keeping their promises to employers, AKP Governments banned almost all the strikes since the day they took power. With this final decision, the number of banned strikes has reached to 14. The number of the strikes banned during the state of emergency has reached to 6. The AKP governments banned our strike in Electromechanical Sector and Asil Steel at the beginning of 2017 and our 2015 MESS strikes before. In addition to the strikes of our union, the strikes of Glass and Bank workers were also banned contrary to the Constitution and international conventions. The Council of Ministers declared the prohibition decision of the strike as of 04:00 am and suddenly destroyed the metalworkers’ right to strike as it is ordered by the President. The right to strike is a universal right. It is a constitutional right guaranteed by International Conventions. Taking away of our right to strike is an open and illegal assault to our right to free collective bargaining. Collective bargaining without a right to strike is “nothing”. The government has made it a habit to ban the strikes by using various excuses. We, as metalworkers don’t recognize the Government’s ban on our strike as we didn’t recognize the previous strike ban in EMİS (electromechanical industry) workplaces before. This strike ban protects only bosses, doesn’t protect workers’ rights, takes away workers right to strike, prevents the usage of a Constitutional right. Today, as metalworkers, we will give our response to those who ban our strike by using our power stemming from production in workplaces. Our union will apply its decision to go on strike on Feb. 2 at 30 workplaces covering around 12 thousand workers covered by MESS. 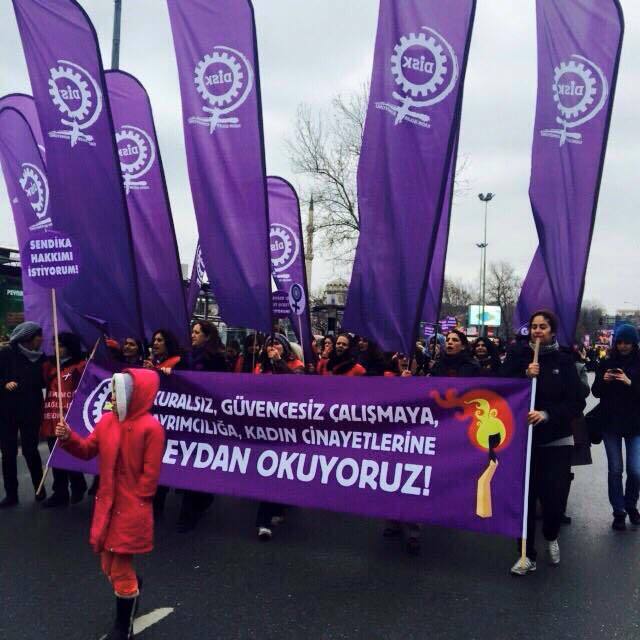 We invite all friends of labor to support this righteous struggle of the Birleşik Metal İş member metalworkers. During group collective bargaining negotiations in GE Grid Solutions, ABB Electricity, Schneider Electricity and Schneider Energy workplace, we couldn’t reach to an agreement. As a result of this, on 20th of January, 2200 Birleşik Metal İş members started our “Metal Strike” with full participation and with great enthusiasm. After we started our strike in the same day, in the mid-day, Government postponed our strike for 60 days. Metal workers very well know what this strike postponements means. This is not a postponement but it is a prohibition. Since 2002, right to strike of tens of thousands of workers in Glass, Plastics and Mining sectors were taken from them by Government. Metal workers also experienced Government‘s strike prohibitions themselves many times. In 2015, strike of thousands of metalworkers against MESS (Metal Employers’ Union) were postponed by Government. 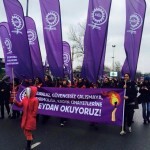 On 18th of January 2017, Strike in Asil Çelik steel mill was prohibited too. Right to strike is a basic right which has hsitory of hundreds of years and it is protected by both Constitution and universal rights. By taking right to strike from our hands, it means right to have a free collective bargaining has been taken from our hands too. Right to collective bargaining without strike “doesn’t mean anything”. Government who turned strike prohibitions into a habit since they took power, is now taking our right to collective bargaining by prohibiting our strike and they simply tell us that “you have to accept whatever employers gives to you”. This means to deem poverty proper for hard working workers. As metalworkers, we don’t recognize Government’s decision which protects only bosses and employers, which doesn’t take care of workers’ hard work, which takes workers’ right to strike from their hands, which prohibits usage of a Constitutional right. We are, as Birleşik Metal İş member workers, as we declared before, we don’t submit to Government’s prohibition of strike. We will defend the right to collective bargaining with right to strike which was earned by working class with hard prices in the history and we are turning our workplaces in to the venue of actions. We don’t take this decision only for workers who are working for workplaces member to the EMIS (Electromechanical Employers’ Union) but we take decision on behalf of all the workers whose right to strike is taken by their hands regularly. Our actions are also warning actions against the Government who uses strike prohibitions as “Sword of Damocles” on workers’ right to collective bargaining , who uses state of emergency as an obstacle to use democratic rights, who brings police and water cannons in front of the workers in every small demand for basic rights. Metalworkers who wrote history many times in the past with their struggle, will once again go on another struggle with great determination which will change the history again. This struggle is against bosses who doesn’t give our hard work’s right and against strike prohibitions of the Government who considers employer’s demands as an order. Our struggle will continue until a collective bargaining agreement according to our members’ demands will be signed with EMIS. We invite all the friends of working class to support this just struggle. 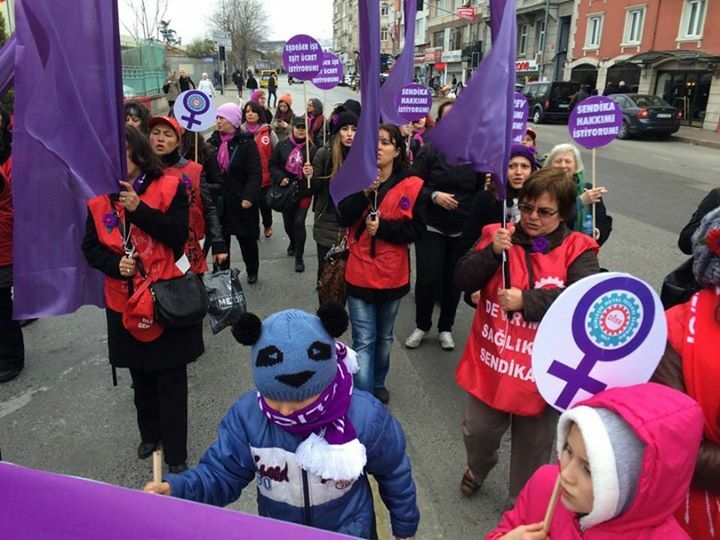 According to a declaration made by DİSK-Birleşik Metal İş (United Metalworkers’ Union) union in Turkey, local labour court of Bursa city in Turkey, ordered French auto producer Renault (RNO:PAR) to pay around 2 million Euros fine for illegally dismissing workers. 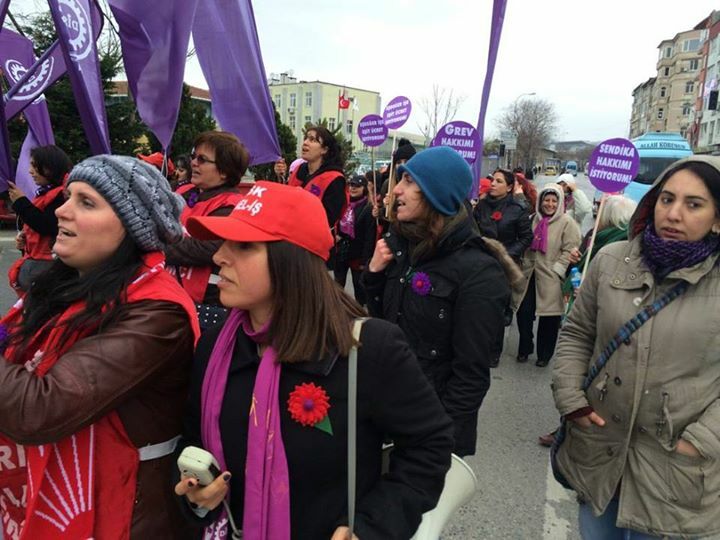 Renault management in Turkey dismissed around 500 workers in OYAK RENAULT plant in Bursa because of their union activity in March 2016. Now the court cases, for these workers are finalizing in the courts of Bursa city. Bursa court decided that these workers were dismissed because of their union activity and ordered these dismissals are null and void and these workers have to be reinstated and court also ordered Renault to pay 12 month union indemnity, plus 4 months salary in addiiton to severance pakcage of these workers which is one month bruto salary for each year workers has worked. 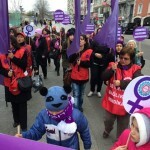 According to calculations of DİSK- Birleşik Metal İş union, this amount is in total more than 2 million euros for 125 workers who opened court case against the company. During the court, judge listened witnesses and looked at the evidences including transcripts and voice recordings of phone conversation between Human Resources Managers of the company and workers. In these conversations, company management was openly forcing workers to resign from their union and threatening them with dismissal if they don’t leave their union. Eventough around 500 workers were dismissed, all of them didn’t open the court cases because they were afraid of not being able to find job if they open court case. Only 125 of dismissed workers opened court cases. So if all the workers would have opened court cases, this amount would be much higher. Beside lump-sum payments court also decided the dismissal of these workers is null and void and they have to be reinstated. Now Renault management has right to appeal this decision in the high court (Court of Cassation) Union told that according to first contact with the Renault local management, it seems like company wouldn’t apply the decision of the court and wouldn’t reinstate these workers. Birleşik Metal İş officials declared that if Renault management wouldn’t reinstate dismissed workers, they would open another court case this time against headquarters of Renault in France. Background: In March 2016, Renault management at first dismissed 10 workers’ representatives after that they started to dismiss all the workers who are protesting against dismissals. As a result of this mass dismissal wave, 75 workers were dismissed without severance package and the rest were forced to resign from work by accepting their severance package. Now court decision covers both group of the workers. Also during the dismissals on 1st of March, poliçe attacked Renault workers with tear gas and unlawfully detained 26 workers in front of the Renault factory. Secular, Democratic, Indepedent, Social State of Law Cannot be Created by Dictators, It Will be Creation of Workers! We are going through extraordinary days. Our country once again came to the verge of a coup d’etat. Starting with yesterday evenning, discussion about a military coup came up. Our country many times has encountered military coups and coup attempts in the past and our country couldn’t recover from the pain and sufferings of these attempts for many years. Our country paid very heavy prices for these. Current anti-democratic governance which ignores rule of law, ignores public opinion and attack worker rights and governs the country for many years has brought our country to the current situation. Since past, workers and people of the country are the those who gets most damages and paid the heaviest price because of coup d’etats which suspends most basic human rights, destructs freedoms and attacks workers’ rights. Suspension of Constitution, dismantling of rule of law, suspension of freedoms cannot be acceptable regardless of which kind of juntaist and authoritarian mindset they are coming from. Working class in Turkey will rebuild secular, democratic, independent, social state of law with determination and common sense. We want decent, secure jobs! Peace will come with women! 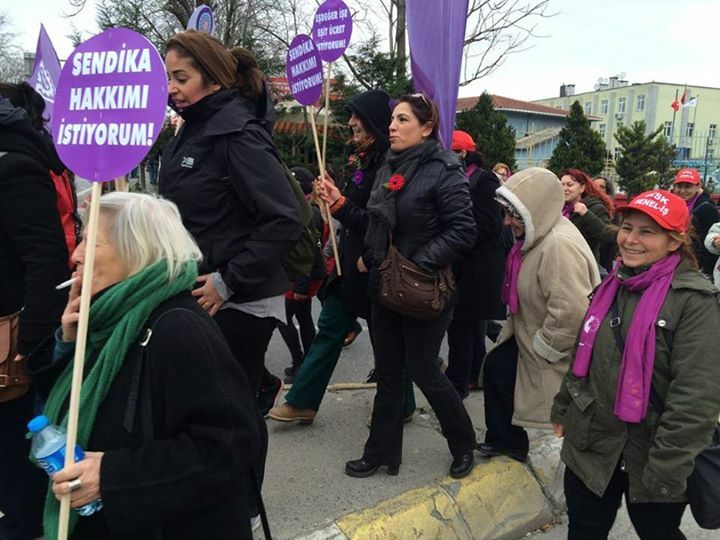 Also on 8th of March, rallies organized in Istanbul, Ankara, İzmir, Edirne, Kocaeli, Bursa, Diyarbakır, Kayseri, Antalya together with civil society organizations. 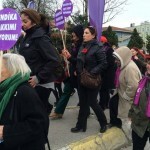 Here, you can find photos from the rally in Istanbul. For Birleşik Metal-İş, the most important demand in our draft was some improvement for low waged workers because in metal sector in Turkey, there is a huge gap between workers who are doing the same job. That’s why, union asked for a general improvement for low waged workers before doing any payrises. But instead of doing this, MESS (Metal Employers’ Organization) widened this gap with the agreements signed with other unions. Also additional to this, they extended the duration of the collective bargaining agreement to 3 years from 2 years which will create more impoverishment for metal workers. MESS imposed metal group collective bargaining agreements which determines starting wages for new workers only slightly above the statutory minimum wage. For example, with the agreements which were signed, the hourly net wage for a new starting worker will be 5,80 TLs for an hour, but on July the hourly minimum wage will be 5,66. So for a worker who will start the work on July and became a union member then if you deduct the union membership fee, the net amunt which this worker will receive, will be even less then the statutory minimum wage. Birlesik Metal Is union will not accept these. That’s why, our union organized a general assembly on 10th of January with all the shop-stewards from these workplaces and the decision of that assembly was to go on strike in these companies starting by 29th of January 2015. 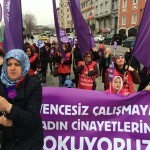 In Turkey, strikes has to go on until there is an agreement otherwise the union will loose its competency so the strike will go on until there is an agreement. It will start on 29th of January but nobody know when it will end. 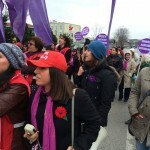 It will be a tough process and two other metal unions already signed this agreement and it will make it more difficult and there is a difficiult winter in Turkey, but Birlesik Metal Is members are determined to end this system of impositions and they will not accept the slavery conditions. But they will need international solidarity during their tough fight. 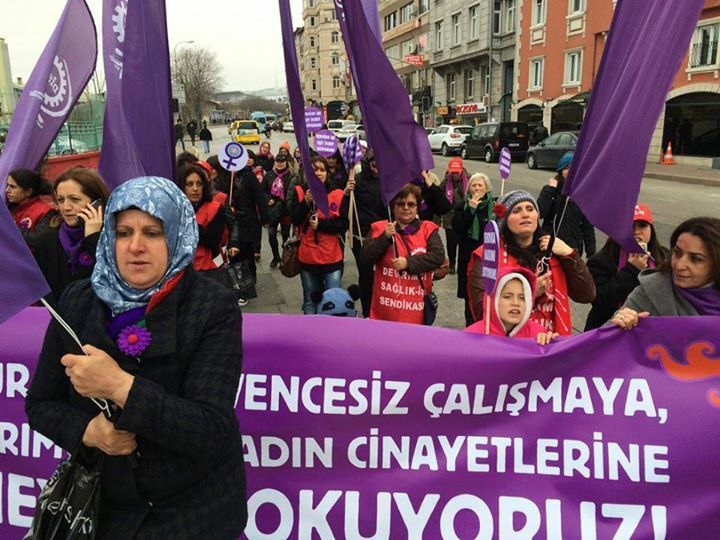 We received news that on 21 April, police violently intervened to break up a trade union meeting which was scheduled to plan for its annual May Day activities at Taksim Square. Indeed, police fired tear gas into the hotel where the meeting was taking place, causing some to be hospitalized. Twelve union officers, including presidents and general secretaries of DISK affiliated unions, were detained in the process. We are deeply concerned that this is just a preview of further repression to come. Indeed, I was at Taksim Square for the 2013 May Day celebrations and saw peaceful demonstrators tear gassed, beaten and hosed by water cannons by the police. The brutality of the attack was shocking and indeed many trade unionists were injured, some badly. 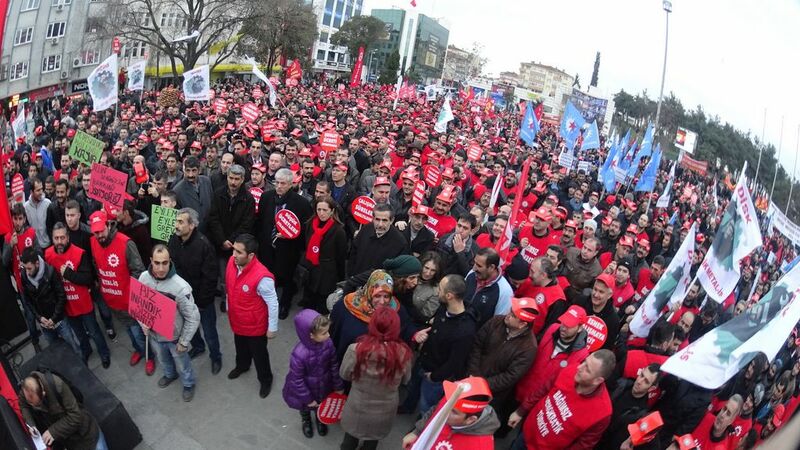 ruled that the Government of Turkey violated Article 11 of the European Convention on Human Rights, concerning the right to freedom of association, when it used repressive measures against members of DISK and KESK to prevent the 2008 May Day rally in Taksim Square. You can reach official translation of the new “Trade Unions and Collective Bargaining Law” here.